As I have mentioned recently. #4 has been fouling out every 2 weeks. I ordered a jet kit. TI night I took carbs off, not apart. And just flipped over and got into the bottom bowls to get to the jets. 1the air furl mixture on #4, was like 8 turns out, the rest were at 4 turns out. I set to 3 turns out on all 4, some say and book says 2.5, which I may yet adjust to. 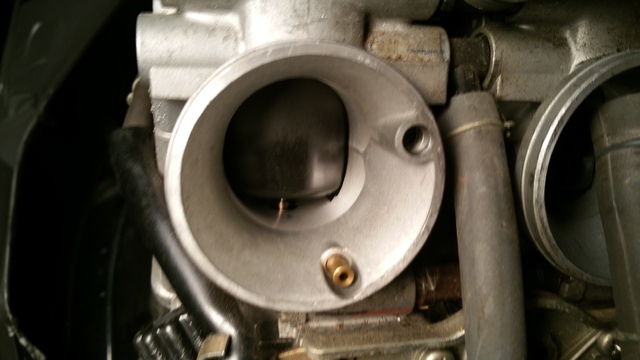 I could see fuel in throttle body on #4 carb. When took off, the rest no. The boots were a pain to get back on. I believe I do indeed have a air leak and will have to dive back in and find it and resolve. The bike is now hard to start, fyi. So I'm not sure I'll stay with these jets or where 2 adjust at. Input needed. 1st test run. As I ran out of daylight and time 4 the day, wow, this baby is a different bike. Wow. It did die on me and was hard to get started, again. Thoughthe I was pushing it home. But got it going. Have to work on more later and see what is the issue. Possible jets 2 big ? Or need to adjust air fuel mixture . 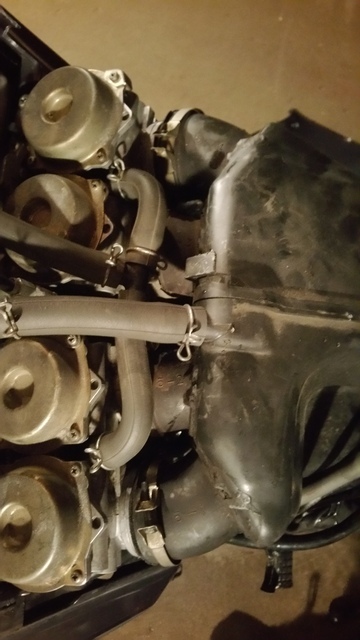 2, 10mm bolts hold on air box. 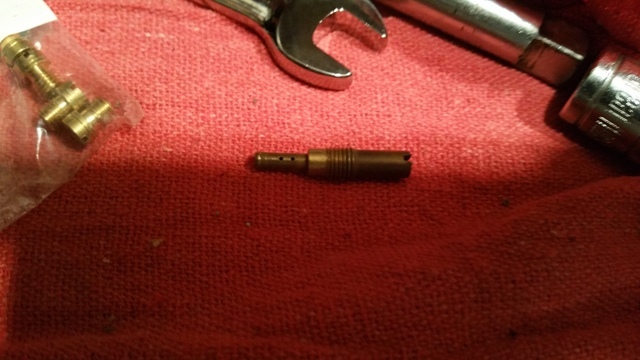 8mm bolt, & Phillips screwdriver for carb housing rubber tubes. I took tank off, 10mm nut, bolt. Disconnect. Fuel line at tank. #4, was getting way 2 much fuel. Can see it in the boot after carb off. Got to find air leak and do adjusting. Even tho 1st test run after install, wow, ran like a champ until it died on me, was hard 2 start back up. Got home. Have to get back and work on it in a day or two, to resolve issues. But pretty sure why #4 was fouling out, that screw out so far. Do I keep the jets in it, the 125, 42, or go back to 122 , 40. Depending on if can get the bugs worked out. 4 into 1 pipe, hi Flo air filter. 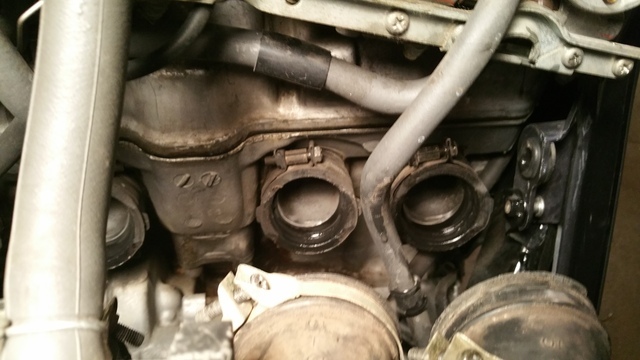 Air leak I believe I fixed, air box, boots at air box, rtv silicone. Seal. Bike does not want to start easily now, have to crank alot. Moved jet needles to 2 down. Was at 4 the at bottom. Went back to the Jets I took out, won't run very well, it's gonna have to go in the shop or sell it. Frustrated at this point. Did you get your hands on a shop manual? It sounds like you just need to take a break and read through the carb section. But those numbers are not working for me, 2 , 3, 4. Turns out on the air, fuel mixture. 125, 42. Took back out. Put back in the 122, 40. Everything back to the way it was and runs worse, it's not drive able at this point, won't stay running. Still have air leak somewhere. I've rebuilt, atvs and snowmobiles. But the one here. Got me beat. One way I check for air leaks is to use either a propane or map gas torch. They are pretty cheap to pick up if you don't have one. 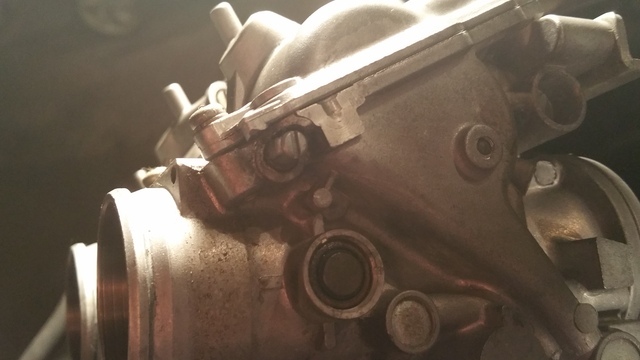 With the engine running, open the valve of the torch, (keeping it unlit) and move it around the whole carb area. 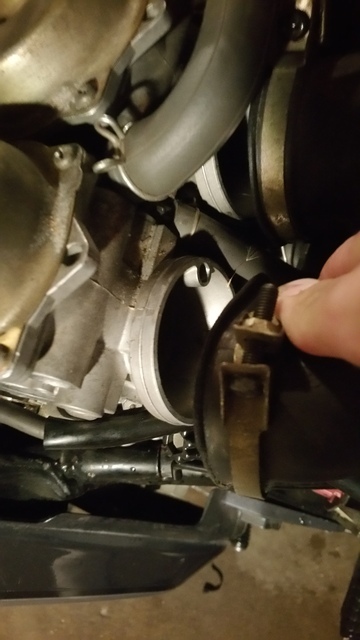 When you hear the RPM increase, you've found the area of your air leak. Some people use other things like starter fluid or carb cleaner but that gets everywhere. I don't believe an air box leak would cause this. If it were me, put 125 and 42 jets back in. Turn the pilots out 2 1/2 turns. Now it sounds like someone has #4 sync way out of whack. 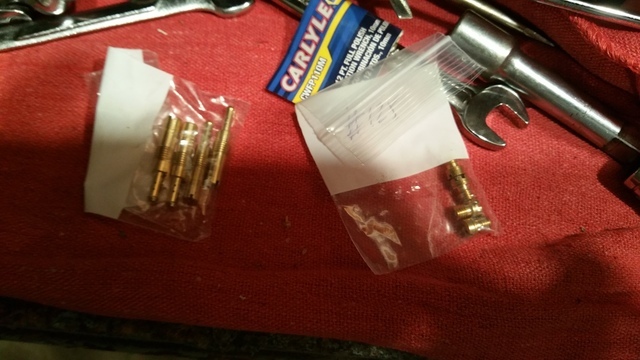 With the carbs still out, using two small drill bits of the same size (maybe 1/16" or smaller) placing one of them under #2 butterfly, adjust #1 so you feel a slight drag. Then do the same for #3 and then #4 in that order. I'm willing to bet that #4 needs to be opened up a bit from your description. Remove both drill bits and adjust the idle gap between the butterflies and carb body to about .003" -.004"" with a feeler gauge. Install the carbs and see what happens. If all is working, you will still need a vacuum sync. From what you posted, I think the carbs are way out of whack and need to be benched in before any further trouble shooting can be done. Last edited by TimBucTwo; 08-31-2016 at 01:05 PM. Reason: I don't know why I edit;somethins I feel like a nut somtimes I don't. A big thank you to tim. Took carbs off, 80% apart, went ahead and removed pilot air screws, cleaned checked tips, #3 screw was nasty and I think clogged. PUT them b a ck i. At 2.5 turns, put the 125, 42 jets in and checked and adjusted butterflys. Made sure they were going up good. 1 was not, so clean and ect. Got it all back in. No air leak, test drove, runs like a beast. I'm very happy. Not sync yet, but I must have got it close, cuz I'm happy happy. Does Seafoam foul your spark plugs? 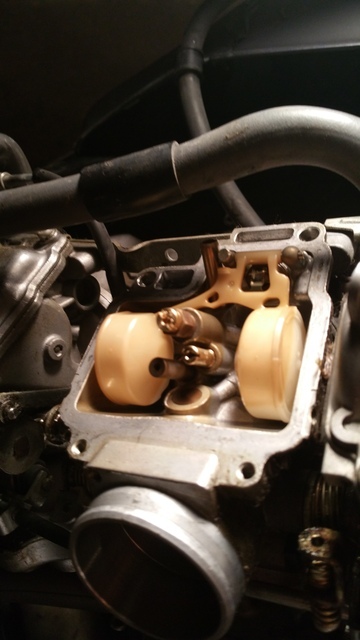 Cleaning carbs or aligning jets?